Microplastics, particles 1 µm-5 mm, are a relatively recent global stressor instigated by rapid human population growth and a consequent reliance on plastics. Particles originate from cosmetic products and the gradual breakdown of larger plastics and eventually reach water courses through surface runoff, wind dispersal and waste outflows. Microplastics are known to impact a range of aquatic organisms, impairing feeding, physiological and reproductive functions, with potentially detrimental consequences for biodiversity and conservation. Whilst many plastics pass through freshwaters, and then pass on to marine systems, the dynamics and consequences of freshwater microplastic are currently poorly understood. This FSBI funded project will therefore address existing knowledge gaps by quantifying the impacts of microplastics on focal freshwater fish and invertebrate taxa. Using novel field research (year 1) and laboratory experiments (years 2-3), I will investigate the individual and community impacts of microplastics on fish, including their disruptions to host-parasite systems. As part of a long term, collaborative research project between BU and the FBA, PhD researcher Tadhg Carrol and BU research assistant Jack Dazley have been assisting freshwater biologist John Davy-Bowker in sampling two rivers in East Stoke, Dorset for aquatic macroinvertebrates (such as insect larvae, aquatic worms and water beetles) and diatoms (microscopic plants with a glass-like ‘shell’). The research aims to understand how environmental changes, such as increased temperature and altered riverbed composition, affect the abundance and species diversity of these groups. Samples were collected from 5 sites at each river – the Frome and the Piddle, where a square sampling area 10m wide was set up from each bank. 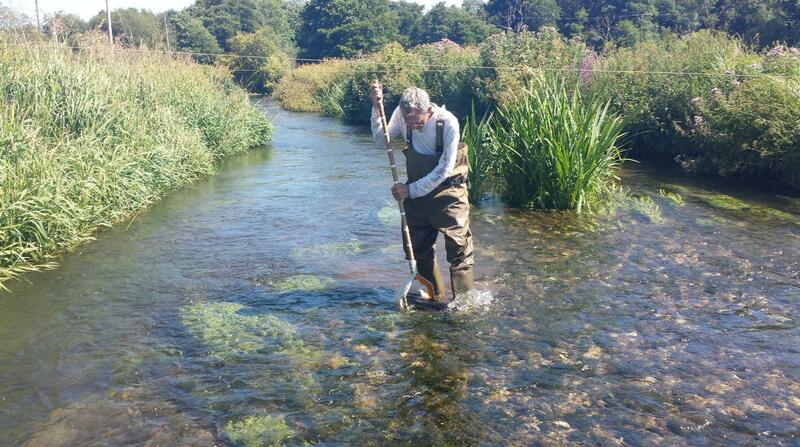 Macroinvertebrates were collected using the kick sampling method (pictured), whereby the person sampling would rigorously kick the river bed, exposing mud and stones, and with them the invertebrates, which flow into the net. Environmental measurements were also taken, and included width and depth of the site, percentage cover of each species of aquatic plant, and substrate composition of the riverbed (i.e. what types of rocks/stones are present). Once collected, the samples were preserved to allow identification at a later date. Diatoms were also collected from each site, and were done so by collecting 5 large stones (one from each corner of the site and one from the centre) which had clearly visible signs of algae growing on them, such as green mats on the surface. Using a toothbrush, a section of the green mat was scrubbed off into a plastic tray to collect the diatoms, and to work out the abundance the scrubbed area was traced onto acetate. The diatoms were preserved to be analysed at the lab. 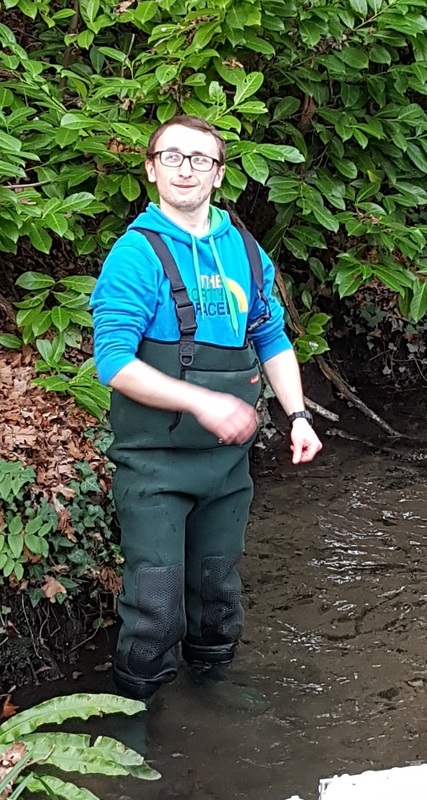 Alongside collecting macroinvertebrates and diatoms, careful note was taken in the Piddle upon the capture and rerelease of protected species, including bullhead fish and white clawed crayfish. These native crayfish are particularly monitored as they are susceptible to diseases carried by the non-native signal crayfish. Infact, the Piddle is thought to be one of the only sites in Dorset where the white clawed crayfish is relatively abundant. This project is incredibly important to understanding the future of river communities from a bottom up perspective – diatoms and macroinvertebrates form the basis of the food chain in river ecosystems, and so support larger freshwater organisms such as fish and birds. A recent assessment of cricket and grasshopper species in Europe has shown that up to 25% are facing extinction. According to the International Union for Conservation of Nature (IUCN), the group Orthoptera, which includes Grasshoppers, Crickets and Bush Crickets, is the most threatened group assessed so far. An estimated 1000 species of Crickets and Grasshoppers are found in Europe. 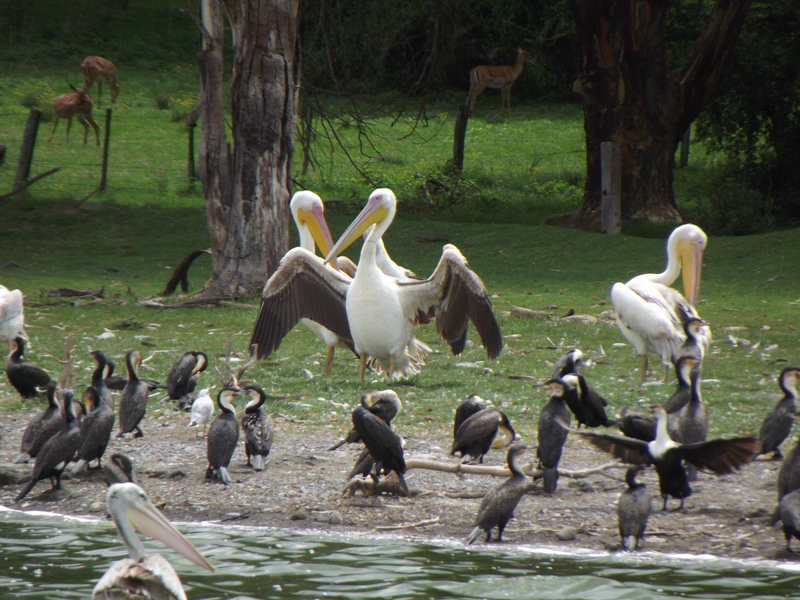 They play a vital role in grassland ecosystems; many species of birds and reptiles feed on them. The main factor contributing to decline is habitat loss due to wildfires, tourism and intensive farming. Many species are confined to small areas due to the break up of their natural habitats; for example the Crau Plain Grasshopper has been confined to the steppes on Southern France. So what can be done in order to protect these insects? According to research from the IUCN Global Species Programme, more effort must be put into restoring the habitats of these insects in order to increase population size. This can be achieved using sustainable grassland management by employing traditional agricultural practices. It is imperative that these insects are saved from extinction, not only because they are very important biodiversity indicators, but also they are an integral part of grassland ecosystems.